If left unchecked, I easily become a Clutter Queen. For me, a kitchen table is a dangerous thing. That’s where unopened mail goes, right? All too often, the answer for me is yes. Sigh. In an effort to keep the kitchen tidy, Dale came up with the idea of getting a hanging basket for fruit. We both had these at home when we were younger and liked how they kept produce easy to grab (they’re also a good reminder that fruits and vegetables exist…I sometimes forget that and find that I’ve only eaten carbs and cheese in an entire day.) 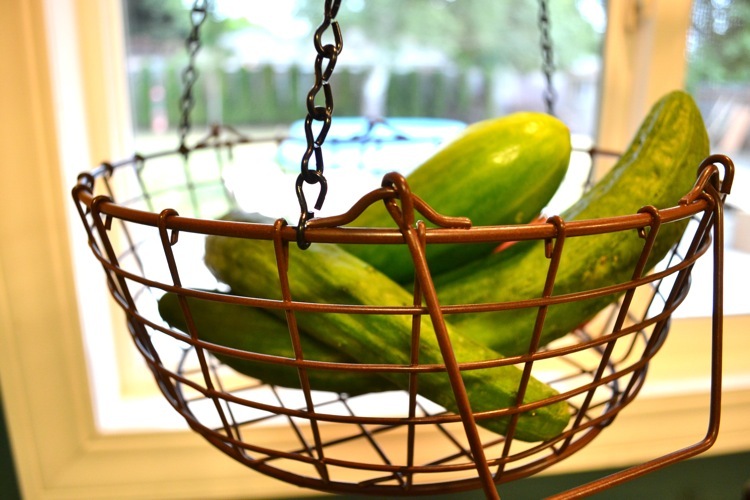 When we couldn’t find a basket to purchase, we decided to create our own hanging baskets. 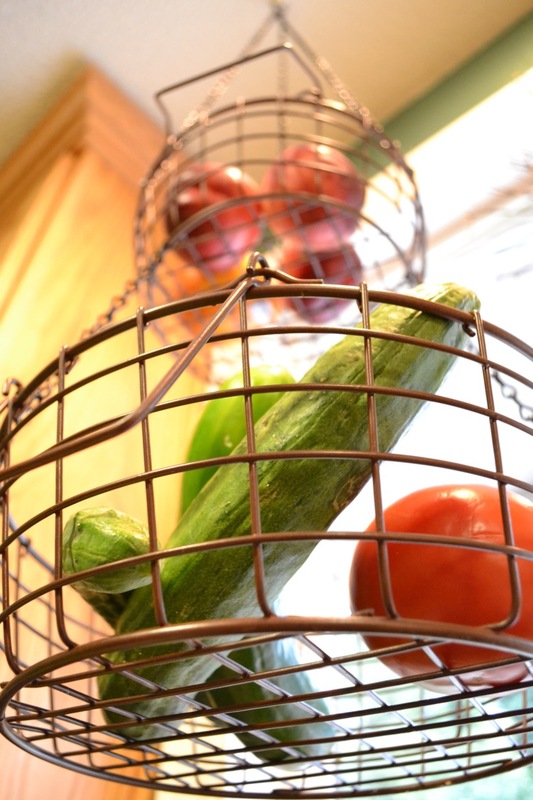 We found some simple wire baskets at Home Goods and bought some black chain from Home Depot. Math teacher Dale showed me the calculations to figure out how much chain to get, and I was going to share them with you, but then I ended up just eyeing the whole thing and that worked out just as well. Having a bit of extra chain is nice so you can get the exact height you want for your ceiling and space. 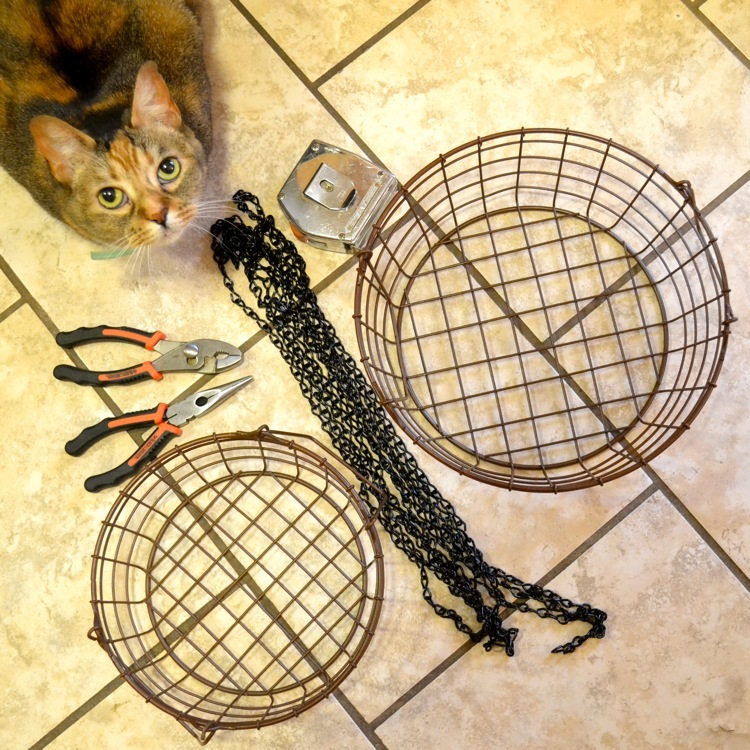 I used two pairs of pliers to open the chain links and attach them to three different points on each basket. I then attached three shorter chain strands to the lower basket, making sure there was plenty of room for hands to reach in and get the goods. At the top, I attached a black carabiner to a ceiling hook, and gave it a few tugs to make sure all was sturdy. The great thing about this project is that you can customize the look depending on the baskets you choose. 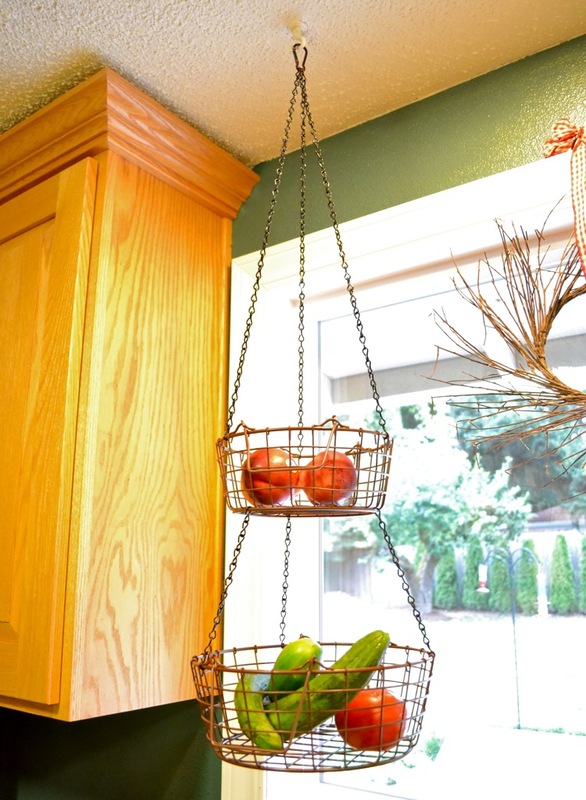 This homemade version is so much better than the original silver basket that served as our inspiration; the darker colors of the baskets and chain compliment our kitchen well. Oh, man. If I kept candy in it…right at eye level…we would have a problem. A delicious, sugary problem.